Posted May 13, 2016 by Apoch. 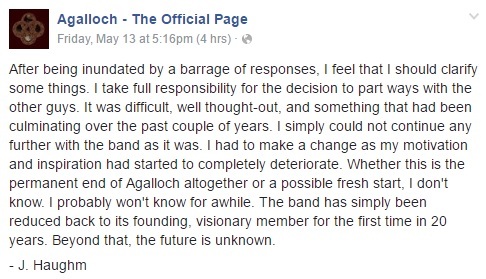 At this time, it would appear Agalloch has not officially thrown in the towel, just acknowledging that the future of the entity as a whole is uncertain. At best, it can be considered a hiatus until the dust settles and a clear decision can be made. Agalloch is currently signed with Profound Lore Records. Their most recent effort, The Serpent & The Sphere, was rteleased back in May of 2014. The single “Alpha Serpentis (Unukalhai)” was released shortly after. Press release composed by Apoch based on a public announcement by Agalloch.